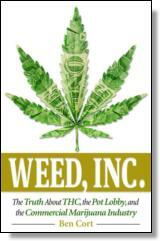 HCI Books - Weed, Inc.
Recovery → Drug Addiction → Weed, Inc.
Let's get one thing straight right off the bat, before we even begin this thing: I am not concerned with casual adult marijuana use. So long as kids don't see you (and if they do, realize that it reduces their perception of risk, making them more likely to use before their brains are developed and causing them much more harm), and you are not driving (I don't think I need to make much of a case against driving under the influence), I seriously don't care if an adult chooses to consume weed. As a recovering drug addict, not only do I not get to throw stones, I have no interest in the conversation. We will get into all of this later, but by the age of twenty-five to twenty-six a person's brain is pretty well developed. The likelihood of doing harm to yourself or others because of your use is significantly reduced, unless you're doing something dumb or irresponsible while intoxicated—so just don't do dumb things! With that said there is potential for harm with any mood-altering substance that intoxicates. I'm not advocating for the adults reading this book to put it down, settle into a comfy sofa, press play on The Wizard of Oz and The Dark Side of the Moon at the same time while blazing one. If you choose to, however, don't drive and don't let kids see you and I won't say a word against it. Warning: If the first few sentences did, indeed, frustrate you, it may be time to put this book down, walk away, hold onto the position that you had when you picked the book up, and keep on keeping on, no hard feelings. With that last thought in mind it's pretty important that you understand where I sit and how that has influenced where I stand. I have opinions about this that have been formed over many years, and more will come out about what has influenced me, but to start off here are a few highlights. I'm a recovering drug addict and alcoholic, sober since June 15, 1996. I am a resident of Colorado living in Boulder County and working in Denver. I am married and my wife and I are raising three school-aged kids. When I wrote this, I was working for a nonprofit drug and alcohol treatment program at the University of Colorado Hospital and have been in this field since 2007. I am also pretty involved in this issue of marijuana policy both locally and nationally. I'll expand on all of this shortly but I think the bottom line is that I am right smack in the middle of the action and I'm keeping my eyes open. Much has changed in my home state the last few years and, among other things, I hope to give you a street-level view of those changes. To counter the list of who I am, I now offer who I am not: a doctor. In fact, I barely graduated from high school and earned my first college credits last year at thirty-six. With that said, I can read and understand the scientific process well enough to understand the studies that will be cited. My knowledge on this subject does not come through formal classroom education although I attend lots of sessions on the subject at medical and therapeutic conferences. Heck, I even led many of them. Trust me, the irony of a guy like me leading sessions for politicians, doctors, law enforcement, etc., is not lost on either me or my lovely wife! More often than not, I will shake my head and laugh to myself before taking the stage, stepping in front of a camera, or sitting down with people who truly shape the world in which we live. In my mind's eye I'm still that kid who got sober and learned to live again. I have been blessed beyond belief. I would much rather be working directly with those struggling to overcome addiction, hanging out with my amazing family, or chasing trout with my fly rod than having this conversation. I do so because there is a real need to write this book; I wish there was not. Alas, if toothpicks were ocean liners we would cross the season toothpicks, my wishing isn't helping much. This is a complex subject and I've been avoiding writing this for too long. In what follows I intend to be honest, I hope to be educational, and I trust what I write will be considered. I care deeply for my home state. My family moved to Boulder, Colorado when I was four years old and remained here until I was twelve when we moved to Northern Virginia, the suburbs of Washington, DC. Home to the University of Colorado, Boulder is a college town with a laid-back vibe; a layover for wanderers with their lives on their backs, most good natured, some intimidating. It's close to Denver but a world away. The foothills of the Rockies are right at the edge of town and you can easily spend the afternoon hiking and fishing. For a kid, it was a magical place to grow up. After marrying much further out of my league than anyone should, I returned to Colorado with my wife, Christy, in the fall of 2003. Money was really tight and we needed to have a yard sale in order to rent a moving truck. We had few dollars in our pockets when we got there and even fewer plans that involved much more than a tent, a fly rod, and a climbing rack. But as I said, I've been blessed. I'd left what I thought to be a promising job in Pennsylvania as a chimney sweep two years earlier for what turned out to be an amazing profession: recruiting. Although I had no job when we moved to Colorado, this was something I'd started doing before I left the East Coast, and I was able to continue it when I moved to the West. I worked for hospitals and helped them find and hire doctors. It was easy work, paid the bills, and, most importantly, didn't get in the way of our exploration of the state. We took road trips, backpacked, camped, and biked all over the state in the ensuing years. As I reacquainted myself with the land and people, and tried to understand both as an adult, I was able to introduce my wife to this place and it to her. Both were richer for it. 1 If this book sells more than the twenty copies that my family and friends will buy, I expect some kind of remuneration from the Colorado Department of Tourism for that last part. ©2017 Ben Cort. All rights reserved. Reprinted from Weed, Inc.: The Truth About the Pot Lobby, THC, and the Commercial Marijuana Industry. No part of this publication may be reproduced, stored in a retrieval system or transmitted in any form or by any means, without the written permission of the publisher. Publisher: Health Communications, Inc., 3201 SW 15th Street, Deerfield Beach, FL 33442. Ben Cort (Longmont, Colorado) spent a decade inside the drug and alcohol addiction treatment field and is now is a consultant to the industry. Ben joined the drug policy conversation at the national level in 2012. He was part of the "No on 64" campaign, and following the amendment's passage—which changed the Colorado constitution to allow for a statewide drug policy for cannabis—he was appointed to the Board of Directors of Project SAM (Smart Approaches to Marijuana) as well as NALGAP (the National Association of Lesbian, Gay, and Transgender Treatment Providers). Ben's passion about the intersection of recovery and public policy makes him a frequent guest in the media.